I wanted to start off this post by quoting Henri Matisse about how every part of one of his paintings has its place and is important. I thought of it this morning while various considerations about my current painting flitted in and out of my mind. As they did I realized that a good painting is like an orchestral composition, with many parts all working together: the light, the color, the shapes, the brushwork, the lines, the values, the objects, their evocations, etc. As soon as I thought symphony and orchestra I was reminded of Matisse's quote. It used to be when I remembered a quote like this I'd go search through my books hoping I could find it without spending too much time. But now we have the internet right? No need for books. Well the problem with that is the sloppiness of the internet. Someone may say that something is a quote of Matisse but how do I know it's correct? I read two versions of one quote today that had somewhat different meanings depending on how much of the quote was shown. So I don't trust what I've found and am not going to use it. It seems safer to just paraphrase my recollection. All of which just leads to the thought that I'm getting happier with this painting and all the various parts of it that I'm trying to get to work together. The newest version is at top. 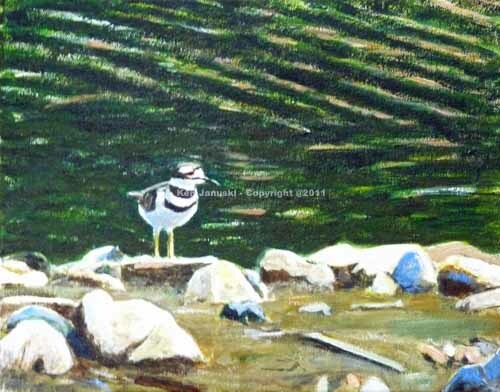 You may notice that the killdeer is about the only constant. Everything else is changing. I hope it will stay that way. I've liked the bird from the beginning and have made only minimal changes. I think this painting is also heading more toward naturalism now. The abstract pattern of the water is still there but it's toned down quite a bit. I've gone back and forth between naturalism and stylization in this. For now it seems like naturalism will win out. And yet even in naturalism every part of the painting has its place, every brushstroke, every color. In that sense every painting is somewhat abstract. I need to turn this in for the show by Friday, and frame it before that. So soon it will be done one way or the other, at least temporarily. It's been a while since I've really struggled with a painting. I surely do remember watercolors that drove me up the wall - I just couldn't control the medium. And there were some pastels that went on and on. With watercolor the problem was that I just couldn't get the medium to do what I wanted. It's a very difficult medium. With the pastels though, and now with this acrylic, it's not so much that I can't control the medium as the fact that I can't figure out what I want to do. Particularly in acrylic it's easy to achieve an effect and get seduced by it. I think all artists know this problem. Sometimes with no effort at all you get something that looks good. Sometimes it just reminds you of the style of another artist that you liked at one time. Because it reminds you of something you liked in another's work it's tempting to accept it in your own. And there's nothing wrong with this. But I think at least for me there's often a lingering doubt that I'm settling for easy effects and not really painting a personally honest painting. This isn't always true. I'm sure that there are many fellow artists who say of an artist: Why can't he just leave it alone? It looks great now and he's going to beat it into deadness. That's the artist's dilemma I think - knowing when to call it quits and save any urges to change for another painting. Well this is a roundabout way to say that I keep changing this painting sometimes drastically. The painting at top is version four. Below is version three. I'm finding a real glare on acrylics that I didn't find in watercolors. That makes it very hard to see. This version was painted late in the day when the light was bad. It got far darker than I intended. And below is version number two. As with all the versions I felt that the top portion/background didn't work with the bottom portion/foreground. This was the first attempt to solve that. One of the things I've also struggled with is stylization versus naturalism. The bottom portion is slightly more realistic. The top is more stylized. I did have it more naturalistic at one point but didn't like it and quickly switched back. As an experienced artist I have all sorts of influences. Right now the top portion reminds me more of Abstract Expressionism and the bottom a bit of Wayne Thiebaud and all the high key landscape painters, especially those from California where I lived for many years. I remember liking this style all the way back to what I always found to be the source Corot. But Corot and Abstract Expressionism don't mix, particularly with a bird stuck in the middle. So I'll be spending some time trying to make this into a honest painting with a unified style. I don't know if it's a curse or a blessing that with acrylic there's almost no limit to the changes you can make! When I was a child I did my first oil painting, probably based on some very cheap beginner set. But it didn't work the way it was supposed to. The paints stayed wet and when I went to put one color over another I got a big mess. I hated oil paint as a kid. When I went to art school I painted in both acrylic and then later oil. By then I liked the fact that the paint stayed wet. It gave me far more flexibility and let to all sorts of interesting effects. But since we moved to our house almost 20 years ago I have not painted in either acrylic or oils. 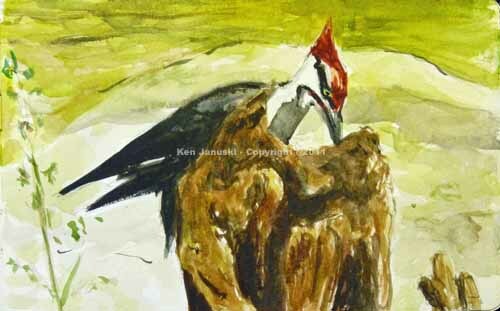 I took up watercolor about six years ago at the same time I started drawing and painting birds. I've been happy with watercolor. But you can't push paint around the way you can with oil and acrylic. You have to be more thoughtful about the first marks you put down. 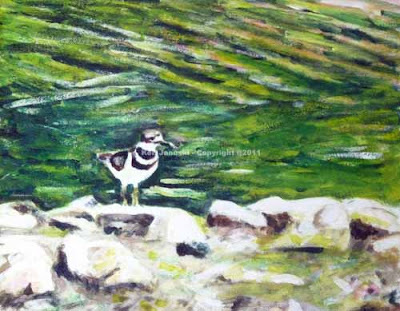 Since I've gotten comfortable with painting and drawing birds I've had a desire recently to try acrylics again. Today I did. This is a small 12x18 canvas. It's based on the ball point pen drawing from a week or two ago. I'm sure I can find ways to improve this, if not ruin it. But for now I'm just happy with the fact that I can push some paint around again. It's a thrill. I bought my first acrylic paints in over 20 years about a week ago. I painted in acrylic for about 10 years, then switched to oils for another 10 years or so. But when I moved from my live-in studio to my home with my wife and cats I felt I really couldn't safely use oils and their solvents in the house. Perhaps I could have switched back to acrylics but there was a problem with that too. No room was big enough for the really large abstract paintings I used to do. Since I switched from abstract to naturalistic about six years ago it made some sense to do my paintings in watercolor. It is traditionally used at a smaller size than many oils and it's pretty safe to use at home. So I've used it, more or less starting from scratch, for the last six years. As much as I love watercolor and as much as I think I've improved with it there are still moments when I miss the freedom that acrylics and oils offer. So that was the impetus that got me to buy those acrylics recently. I've spent a lot of time recently looking through photos and old sketches trying to find the subject for my first acrylic. 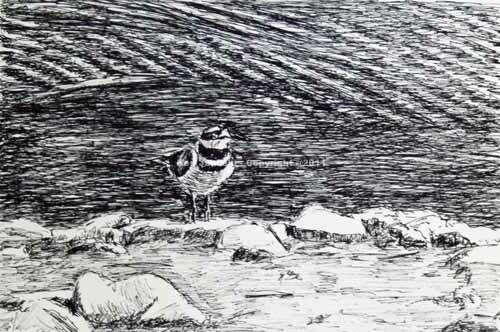 The Bic pen sketch at top seemed like it might work as a painting. I could see myself finding a lot to play with in the water and foreground sand and rocks. But last night I finally became a member of the Manayunk Roxborough Art Center Artists Coop. And there is a group show in less than two weeks! All of a sudden I started thinking about what I could include in the show. Rather than undertaking a painting in a medium I haven't used in 20 years it seemed better to return to small watercolors. 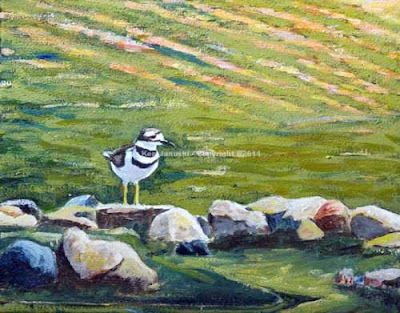 So that is the second image at top, a breeding male Kildeer seen at the wetlands pond at Morris Arboretum this spring. Those orange washes on some of the feathers are just irresistible. I may touch this up a bit but I've already gone overboard with the background and lost a bit of the sparkle of untouched paper. So I'll do very little more. I had thought I would use kildeer on my way to my first acrylic painting. Instead I ended up with a surprise watercolor painting. But I can't complain. Unless I turn it into complete mud there is always something appealing about watercolor. Acrylic will have to wait a bit. Any local readers may wonder just how I or anyone might propose to make Philadelphia birding better. A very good question. Surely I'm not about to announce my patent on attracting rare birds. No. My discovery was accidental. The PA Audubon Rare Bird List listserve had an email the other day about an unofficial 'Bird Day' this coming Saturday, September 17. When I looked at the link for Pennsylvania Audubon I found a short article about three bird festivals this weekend. Below that I found a link to a new Fairmount Park IBA Bird Checklist. It's the latter that's my secret for better Philadelphia Birding. Compiled by Keith Russell of Audubon PA it's a wonderful essay and checklist of birds found within Fairmount Park, including Benjamin Rush State Park. Keith has organized the Philadelphia Mid-winter Bird Census for 25 years. I and Jerene have taken part in it for the last five or six years. Each mid-winter report is a thrill to read, noting what birds are here in early January, and also how their numbers compare to birds seen in previous years. The new Fairmount Park checklist is the similar but on a much larger scale. Each species is shown in a bar graph that shows frequency by month. Also included in the same bar graph is likelihood of presence in six locations: Wissahickon, Pennypack, East West Reservoirs, Cobbs Creek, Poquessing/Benjamin Rush State Park, and Roosevelt Park. 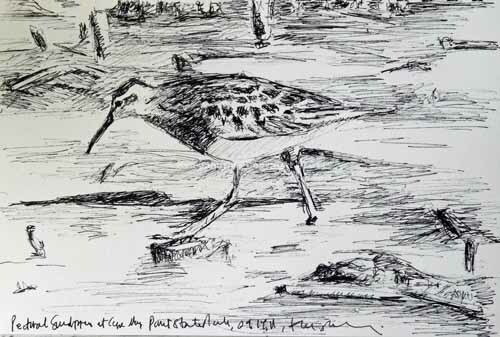 Looking at a random entry I see that a Semi-palmated Sandpiper is only likely to be seen at Pennypack, especially in May, July, August and September. A rarer Philadelphia Vireo is likely to be seen if at all, during September and early October at any of the locations. Of course there are other Philadelphia locations where birds might be seen. 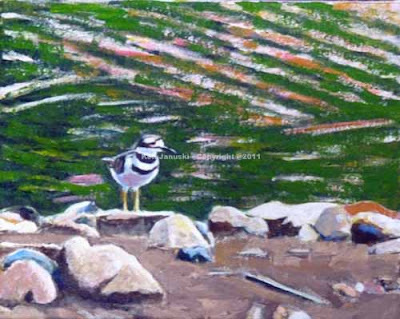 But this checklist encompasses many of the areas available to birders. It's particularly valuable to me since I spend so much time at the Wissahickon. It also makes me more likely to investigate areas like Pennypack, Benjamin Rush or Roosevelt Parks. What I most enjoy though are the species entries. For instance the entry on the Philadelphia Vireo, a species we THINK we've seen twice at Magee Marsh in Ohio both spring and fall migration was first discovered in 1842 by John Cassin in an area of Fairmount Park known as Bingham's Woods. Now it is observed only during fall migrations with rare exceptions. This type of information is both invaluable and just plain fun to read. Some beginning birders might find it a bit overwhelming though even for them the graphs and species accounts indicate the likelihood of seeing certain species at certain times and places. It's always good to know how likely birds are to be seen in any locale, regardless of how experienced you are. I think the checklist is most valuable though to slightly more experienced birders. It's thoroughly enjoyable to read a species account and compare it to your own experiences, or to read that species that you rarely see are actually fairly common at Roosevelt Park for instance. And of course there is the history. To me it's fascinating to know how the Philadelphia Vireo got its name and to know its local connection. In keeping with this historical theme one of the three festivals taking place tomorrow is the Cradle of Birding festival at Tinicum. We've never been before but are going to try to make it tomorrow. Philadelphia really is the Cradle of Birding in many ways. I always forget that, especially since I have little connection to much of the local birding community. If I had I'd probably be more mindful of it. In any case it is amazing to realize how much of American birding took place here. It should be enjoyable to go to a festival celebrating that. The newly arrived cooler weather should make ti all the more enjoyable. 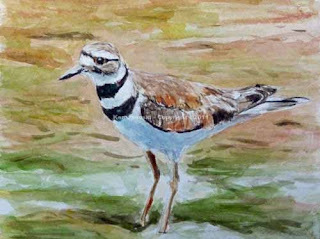 Finally, if you've made it this far, I did the small 8x5 inch watercolor at top as an illustration of one of our local birds that appears on Keith's checklist. This is based on a photo I took of a Pileated Woodpecker drilling into a dead tree with the Wissahickon behind and below him. The stream, and the large rocks in it, visible through a few inches of water, is what gives the yellow-green color to the painting. I'm not too happy with this watercolor but it does serve it's purpose of illustrating local birds. And it's the first watercolor I've done of one of my favorite local birds. Maybe it will lead to more. I picked up some acrylic paints and a couple of small stretched canvases yesterday. I haven't painted in oil or acrylic in about 20 years. 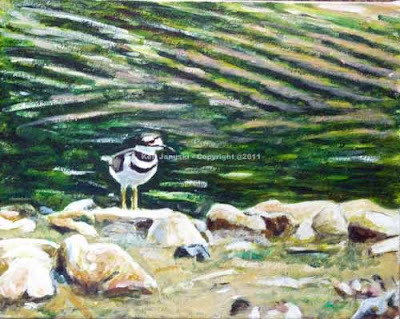 But there has been a hankering, especially as I've gotten more comfortable using birds and nature as my subject. 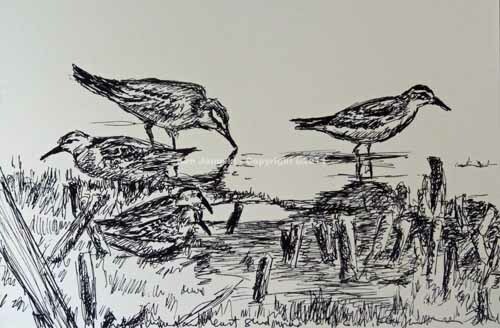 As I wait for inspiration, or perhaps courage, to hit me though and get me to start that first painting I continue to experiment with ball point pen and shorebirds. I've always liked ink. It can be intimidating since it's permanent. You can't erase a line as you can with pencil. Since my lines tend to feel their way along, searching for the right contour, rather than precisely putting down the correct line as soon as the pen hits the paper this can present a problem. I'm likely to have a lot of exploratory lines. But this rarely bothers me. I tend to make the first lines light and then darken them when I'm more certain. Of course this doesn't always work. Sometimes I make a dark line where I'm wanting to delineate the edge of a light object. The line looks wrong. But I just live with it. I think the appeal of ink is that it's permanent. So the same thing that makes it intimidating also makes it appealing. It's an odd thing. Still I like it. I don't have to worry as much about smudging as I do with pencil. And the end result almost always looks more like a finished work of art. The 'quickest' line I ever found was made with a bamboo pen dipped in ink. It flew across the paper, often leaving huge ink drips in its way. I don't use it anymore. But there is a lot of speed in the Bic 537R ball point pen I'm testing out. There's nothing inherently good about quickness in a drawing instrument. But for me I think the appeal is that the pen can keep up with the speed of my thoughts or intuition on what to do next in the drawing. It just moves effortlessly, like there's a direct connection from my brain to the paper. I have loved drawings for as long as I can remember. 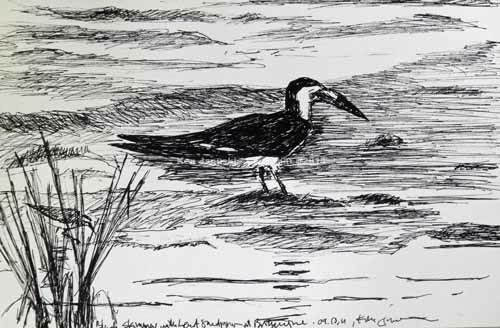 Not that I want to compare myself but when I try to render the mud and water in the drawings above I'm reminded of how much I used to love Rembrandt's drawings and the way his landscapes in pen and ink, and sometimes wash, seemed to so effortlessly portray land, water, sun and shade. They were a miracle of draftsmanship. I think it's partially remembering that aspect of his drawings and many other great drawings that keeps me interested in doing these. As I said I do have some new acrylics and some new linoleum blocks. But for now I'm just captivated by pen and ink. The drawings are based on photos I took at Cape May in mid-August. 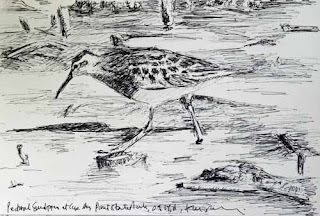 I also did many field sketches and I'm sure that experience enters in as well. At top is a Pectoral Sandpiper. I probably should have elongated his neck just a tad. Below him the always striking Black Skimmer. I rarely see them as close as this one. So it was a great opportunity to sketch and take photos. Also in the drawing a small Least Sandpiper, hidden by some reeds. The Black Skimmer is such an unusual looking bird, and an elegant one, that I'm sure I will return to him. 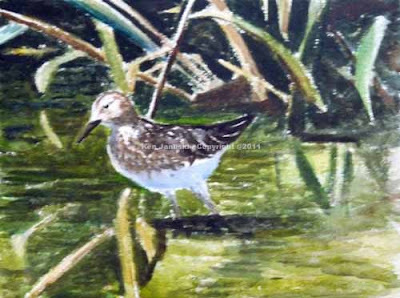 As you may have guessed I can't resist all the verbal tricks that are occasioned by an adjective that also functions as a noun.The 'least' I'm talking about is the Least Sandpiper a very small shorebird, and I believe the smallest US sandpiper. 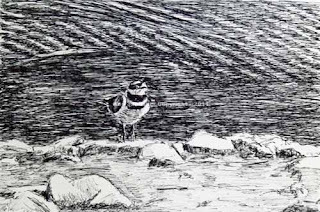 Some artists I really admire at birdforum.net, Alan Dalton and Paschalis Dougalis, have recently shown work in ballpoint pen. As I recall both mentioned using the ubiquitous Bic pen, though European versions are not the same as American ones. Still it was enough of an impetus to get me to find some Bic pens and give one a try. One reason for this is that I like the idea of the quick line available from a ball point pen. The line can move very quickly. It doesn't get stuck in the surface of the paper. 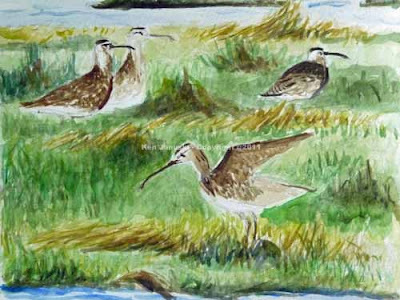 A White-rumped Sandpiper is the star of the drawing above. He's what follows the 'And ...' in the title. He's surrounded by Least Sandpipers, all seen at the ponds near the hawk watch platform at Cape May Point State Park. This was one of many lifer White-rumped Sandpipers that we saw there. What I liked about the photo that this is based on is that it shows how different their poses are. In fact my drawing is a bit off in not having a greater angle in the White-rump. Its tail tilts up about 5 degrees more than I show. So in silhouette it really looks much different than a Least. And of course it is larger and more slender. When I lived in San Francisco in the early 70s there was a seemingly universal idea in the air: Try Everything. I didn't and in fact it sounded sort of foolish. It still does. But it's also foolish to get stuck in a rut. For me I've found that I need to digest one medium or method of work enough to get some feel for it. Eventually I'll want to try something new. And I do. But the idea of constantly trying something new is something that's always seemed silly to me. In any case I feel fortunate in being able to change media at a comfortable pace. This is also done on Stillman & Birn Gamma paper, with a Bic 537R pen. .7 mm. point. 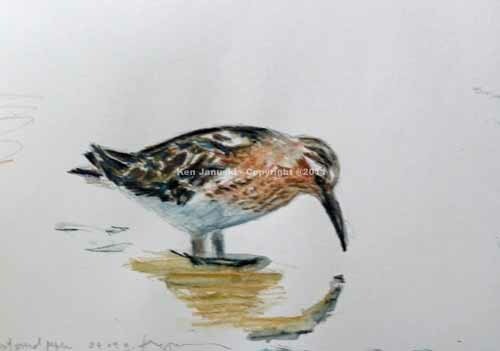 Or maybe the Least (Sandpiper) I can't do. You'll have to judge for yourself based on the images above. Unlike my last entry of the Whimbrels both of these are based on photos that I took. The larger watercolor on 9x12 inch Arches 300# cold press paper is of an immature Least Sandpiper that I saw at Morris Arboretum in late July/early August. The second is a small drawing using Derwent watercolor pencils on 7x10 Stillman & Birn Gamma sketchbook paper. I believe that photo was taken at Tinicum at the same time, though it also might have been taken in Cape May in mid-August. I've never liked watercolor pencils. They're not my cup of tea. But I recently realized that some drawings by Michael Warren in his book 'Shorelines' might have been done in color pencils. The drawings struck me as a good way to do quick color sketches in the field. So I brought out my old Derwents. But I immediately started doing a drawing that was more painting than drawing, especially after I added water. So I completely contradicted my original intention of testing color pencils as a way of doing quick field sketches. I and color pencils just don't seem to have a future. The watercolor on the other hand has its own complications. I've only used this paper a few times before. I thought I'd be happy with 300# pound paper since it should be less apt to warp. That's probably true. But I can't make a clean brushstroke. As though being sucked in by a powerful vacuum as soon as the brush gets near the paper the water and pigment seem to jump off and form a streaky blob. The end result is that I end up working with more pure pigment and a very heavy brush. So the painting gets dark and looks more like an oil painting than a watercolor. Still you learn something from every medium you try. Or at least you do if you pay some attention. Otherwise things could get very frustrating! I think this is an example of the fact that almost all visual art, and maybe all art, has to be a dialog with your medium. You can never fully control it, though you can certainly control it more than I do. But in the end there's always a give and take. That's particularly true in printmaking, which I may return to one of these days. 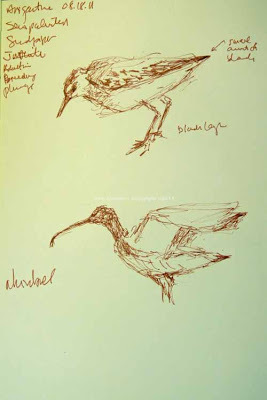 By the way the Least Sandpiper is among the smallest of shorebirds, unlike the Whimbrel of my last post. It's on the large end of the spectrum. I rarely see shorebirds in Philadelphia unless I make a special trip to Tinicum. But I'm starting to see Least Sandpipers with some regularity at the nearby Morris Arboretum. It almost seems like they're becoming old friends. The small watercolor, about 7x10 inches, above is based on a very quick field sketch I did of a Whimbrel raising its wings on Nummy Island near Stone Harbor, NJ a couple of weeks ago. The field sketch is below. One of the things about sketching, and not photographing birds, as you see them is that you can convince yourself to try difficult but striking poses. Often in nature you get these surprises that are just there for a split second. As an aside at about the same time I saw this bird I also saw the grisly spectacle of a Great Blue Heron finding and swallowing whole a Clapper Rail youngster. It was too far away for me to see clearly. Grisly as it is I might have been tempted to sketch it if I could have seen it better. My point though is that I think it allows you the chance to try something that you might think is beyond your abilities. As with many things you often find that you can do better than you expect, if you just try. Now I have a lengthy history of deep disappointment with my field sketching so I'm not being hopelessly optimistic about this. But time and experience has shown me that the biggest obstacle is just the fear of trying. If you keep at it the results are surprising. In addition you can come home with the seed of a painting of a striking experience. It's possible that I might have been able to get a photo of this. Unlikely but possible. The problem for me as an artist is that I don't get much artistic inspiration from my photos. Not for all of them but for many. With field sketches though I really recall the entire experience. There's a real desire to put it into a painting. In fact I also have some photos of whimbrels I saw a year or two ago. I've looked at them many times but never felt enough of a connection to start a painting. But once I decided to do a painting based on the field sketch it was much easier to use the photo as the source for the background birds here. But it took the field sketch for me to decide to do it. The sketch took about a minute. The bird had its wings up for a split second. I had to trust that I had seen it well enough in that split second to put it down on paper. Over time I've gotten much more trusting about that. And I'm almost always pleased with the results. I think we always underestimate how sentient we are.